It's been an exceptionally busy couple of years for Benighted. With four releases since 2014 it's a good time to be in love with the slam masters. For those of us who didn't get enough after last years truly excellent Necrobreed and the band embracing new frontiers, we have Dogs Always Bite Harder Than Their Master a sort of combo EP plus live record with the goal of celebrating the bands twentieth anniversary. It's crazy to think that a band this out of left field could last this long, but now with a career spanning three decades and no sign of slowing down, Benighted are elder statesmen of the genre. I actually really love the idea of fusing a few studio originals with live music. It gives you, in a nutshell everything that you need to know about these French grinders. Toss in an incredible and wholly unexpected cover of At The Gates Slaughter Of The Soul and you start to get a sense that Benighted are far more than the sum of their parts. 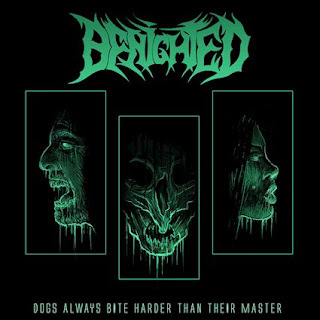 Thirsty for blood and ready to melt the world, Dogs Always Bite Harder Than Their Master is an ode to death metal slaughter, flesh and the power it holds. It perfectly encapsulates everything that I have loved about these madmen since high school and even builds on their legacy. Benighted are the sort of band who perfectly embody the sort of demented magic that the French extreme metal underground can conjure up. Bone crunchingly brutal and surprisingly intellectual without being pretentious, it's clear from the first listen why this band has lasted this long. When the sick breakdowns kick in you find yourself overwhelmed with the power of these songs and the deeper you delve the more you will fall in love.